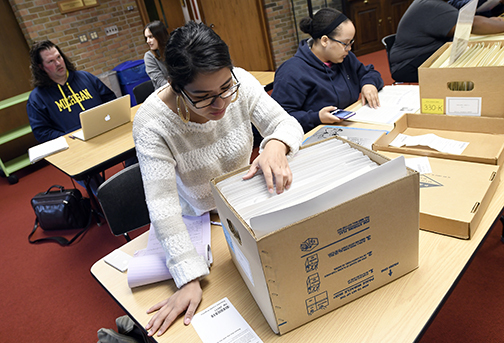 One class mines Bentley archives to investigate the history of campus protests and the origins of U-M’s Trotter House. Thomas Leatherwood III admits to feeling a bit “weird” and a tad “voyeuristic” as he sat at the Bentley Historical Library and picked through a box of correspondence between University of Michigan administration officials, including then president Robben Fleming, as part of his research for the class Introduction to African American Studies. Leatherwood was studying how University officials were navigating the turbulent black student protests on campus in 1970. He says it was strange reading these private letters as administrators discussed what to do and how U-M could become a more multicultural place. “I would pick up these letters and was like, ‘Well, I’m not cc’d on this but I’m going to read it anyway,’” he says with a laugh. An African American Studies student sifts through boxes at the Bentley. Leatherwood and his classmates spent the term using the Bentley archives to research the history and role of Trotter House, the student center for black students opened in 1971 as a result of the protests. 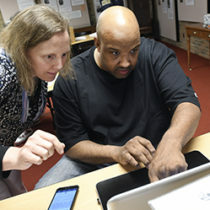 With the help of Bentley archivist Cinda Nofziger, the students searched through specific collections looking for a research topic involving Trotter that interested them. Students ultimately investigated topics such as the request for black-only dorm floors, the events Trotter hosted over the years, black student newspapers, how the greater Ann Arbor community reacted to the black student movement, and more. Students gave presentations at the end of the term, first to the Bentley staff and later at an event at Trotter House. 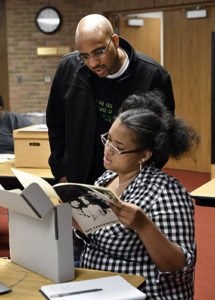 Professor Stephen Ward (standing) helps a student study materials in a collection. Professor Stephen Ward chose Trotter as the focal point for a few reasons, he says. Trotter House was part of the same historical moment at U-M from which African American Studies emerged. The house also has a rich but not widely known history. And a new multicultural center will be built on Central Campus to replace Trotter House, “so this is a particularly opportune time for students to explore the history of Trotter,” he says. He also came up with the course idea around the Bentley archives and worked with Nofziger to plan the class. Ward says he wanted students to understand the origins of the field of African American studies, including the intellectual roots, political context, and social movements from which it emerged. “I also wanted to expose students to the Bentley and to archives in general, and provide the students with an engaging research experience,” he says. Leatherwood was thankful that the Bentley opened his eyes to how administrators made decisions, especially those policies he thought were misguided.